Last month, there were estimates that the Nintendo Switch had sold roughly 1.5 million units worldwide. Fast forward to today, and Nintendo has finally announced its official sales numbers for March, at least in the US. The numbers come from Nintendo of America, which cites NPD data that has the Switch at 906,000 units sold in March in the US. In announcing those numbers, Nintendo says that Switch is selling "faster in its launch month than any other video game system in Nintendo history." We still don't have worldwide sales numbers for the console, but Nintendo promised to provide those during its April 27 fiscal earnings report. What's even more interesting in these numbers are the sale figures Nintendo shared for The Legend of Zelda: Breath of the Wild. The game sold about 460,000 units for the Wii U, and 925,000 for the Switch. If you're keeping track, that means that the Switch version of Breath of the Wild actually outsold the Switch itself. Nintendo addressed this, saying, "This may be attributed to people who purchased both a limited edition of the game to collect and a second version to play." These numbers help to explain the rumors that Nintendo was planning to double Switch production. These numbers may be the best in Nintendo's history, but they still don't match up to the Xbox One, which sold over 2 million units in its first 18 days, and the PS4 sold 2.1 million units in its first 14 days. We'll see how the worldwide numbers stack up when they're announced later this month. Pay attention to software sales when the holiday season rolls around. 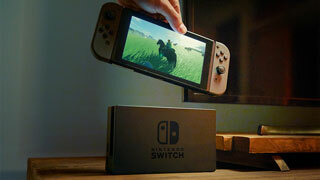 If people are buying lots of Switch games (realative to number of systems sold) then the thing must have some staying power as a gaming device. My thoughts exactly. The real question is longevity. I don't think anyone questioned if the Switch would sell at launch. The real question is how well it continues to sell. The Switch has a lot of interesting niche titles coming to it in the coming months, but longevity on Nintendo consoles is usually determined by the flagship releases. Moreso than any other console in the current gen. I can't hear Nintendo over Persona 5. Sorry. "This may be attributed to people who purchased both a limited edition of the game to collect and a second version to play." Really, there's people that doing that for a game ? 25k people that are doing that ? Makes sense, considering all the hype that was generated, and the fact that, along with Nintendo's typical relatively high sales in America compared to Japan, as well as the fact that it was made for Japanese lifestyles (being a good entertainment investment for a culture constantly on the go). All that combined, it'd be a massive fail on their part for it not to sell fast. Yep. Also folks who bought it in the hopes of getting a Switch when production allowed for it. Funnily enough, it seems that with the way P5 was handled, those worlds are starting to crossover. What with the way Shadows now contain SMT-style demons and spoiler-related reasons.